That's right, our Italian guests. Insane, I know, considering this dinner was just for them. So instead of 8 we were 5 and instead of 2 lbs of pasta we cooked 1. Not a big deal really, everything turned out delicious and now we have lots of leftovers. Rubee made the appetizers. An antipasti plate consisting of some oven roasted tomatoes, thinly sliced salami, herb marinated black olives, bocconcini, and roasted banana peppers with garlic. 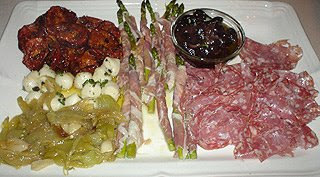 The star of the platter was the prosciutto wrapped asparagus with truffle butter from epicurious.com. 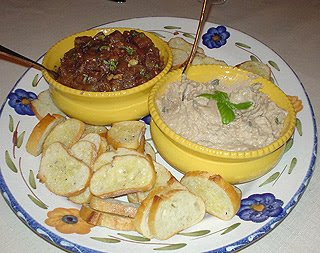 She also did two bruschetta toppings: Mario Batali's Eggplant Caponata and his White Bean. We kept dessert simple and had some coconut macaroons and sliced peaches. All in all the night was a success. I think our Italian visitors would've been impressed. My mouth is watering! 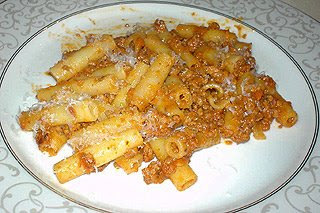 That looks like it was a fabulous dinner - indeed good enough to impress any Italian. You should have invited me. Wow! just as I had imagined it to be. Simply scrumptious! Please come and claim this award from me because this is how much I enjoyed your dinner. Once they see these pics, I think they're going to feel some serious regret.